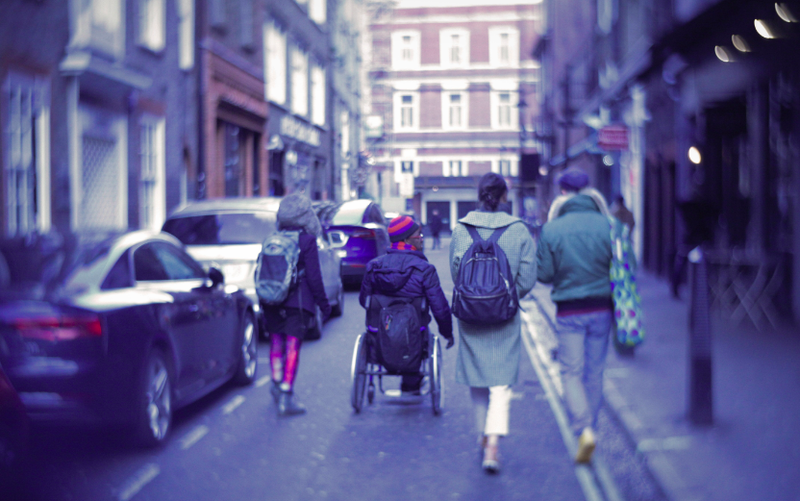 On 02.02.19 – A year and a half on from a ‘Queer Disability Tour’ highlighting LGBTQI venues which denied disabled people access, campaigners have found the majority of gay bars and clubs stepping up for equality – and others continuing to fail disabled people. 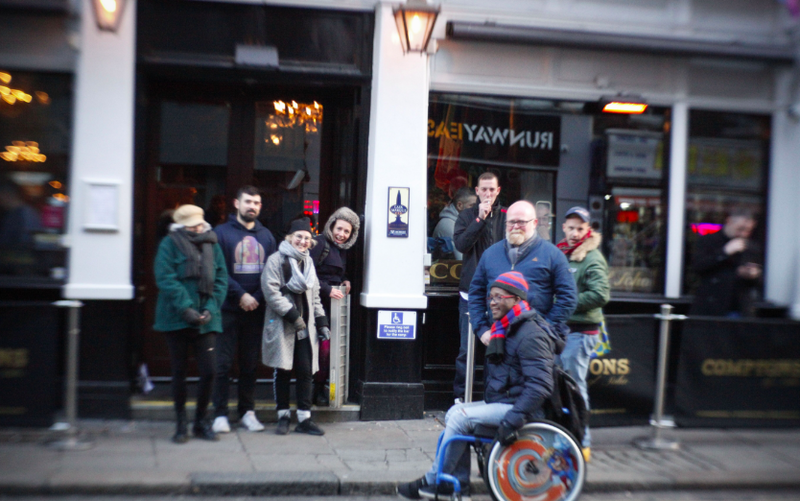 The ‘Queer Tours of London – A Mince Through Time’ group visited six venues in Soho, asking them what access changes had been made since the group’s first visit in July 2017, when the campaigners requested that the venues improved disabled access. Of the six venues, five had installed temporary ramps, while one, Comptons, has also installed a sign and doorbell. Four promised to put up a window sticker so that passers by can see that stepfree access is available. One, Balans, which has a step into the premises and no ramp, had made no changes since the campaigners first requested that they improve access. When questioned, the manager on duty would not commit to implementing equality for their disabled customers. Since 1995, pubs and bars have had a legal duty to make ‘reasonable adjustments’ such as purchasing a portable ramp to ensure that disabled customers can access their premises with the same freedom and independence as non-disabled customers. However, compliance is poor. The group is now considering legal action against Balans under the 2010 Equality Act. ‘It’s easy. I ordered the ramp and access sticker in a day, and put in the doorbell overnight. ‘Why should people have to question whether they are allowed to come. All of a sudden you allow people that might not have thought they could come into the venue that they care about us.’ James Bartlett, Manager, Old Comptons. 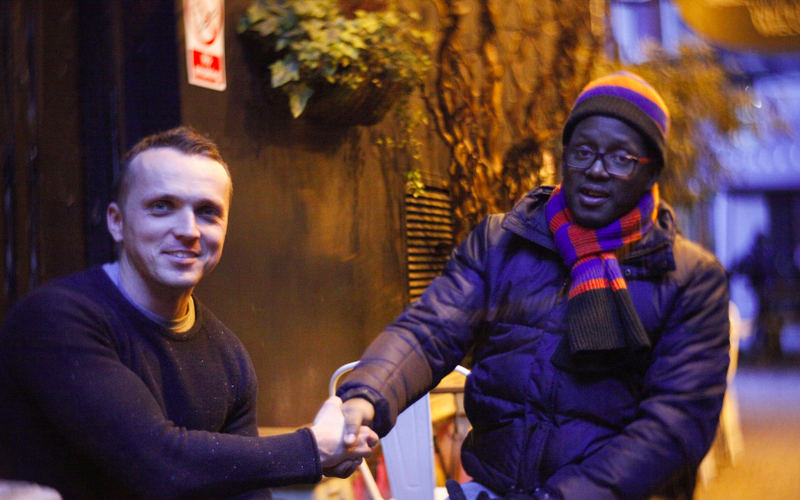 “It’s great to see that more LGBTQ venues in Soho are getting serious about inclusion and equality, making the changes that ensure their disabled customers can have a night out without access stress. Shane Knight, who works at the Duke of Wellington, said: “We’ve had a ramp for years. It’s about access for all”. 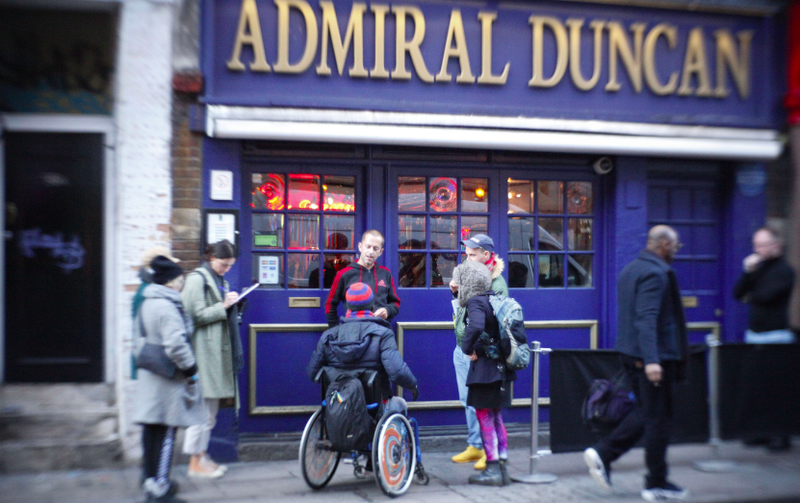 Karl Nixon, from the Admiral Duncan pub, said: “We got a ramp, and we’re going to get a sticker [to let people know a ramp is available], because it’s important to the gay community and beyond. We have a lot of people coming in with wheelchairs now, it has made a difference”. ‘Queer Tours of London – A Mince Through Time’exist to shine a light on London’s rich LGBTQI history through creative and life-affirming interactive tours. We tell the stories of London’s queer history, shedding light on the lives, spaces, identities, repression and resistance that form the backdrop of LGBTQI lives today. 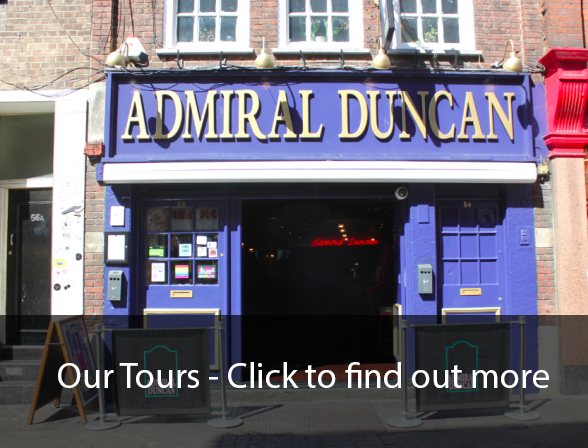 We do this through educational, accessible and interactive walking tours, cabarets, street-art and events that bring life to the complexities and lived experiences of our history, present and vision for the future. ‘Queer Tours of London’ are for everyone in London – visitors and residents – to be inspired by our history and get involved in our future.We also welcome requests for special-themed tours, private tours and all kinds of collaborations. Contact us on queertoursoflondon@gmail.com for all involvement / press requests / collaborations. Admiral Duncan Have ramp – but don’t have a sign in window – GM wasn’t aware should have one. But very happy to talk to us and accommodating. Comptons James was really amazing. They had a ramp and disability sign. Talked about how a few years ago there was an incident in which they didn’t know where the ramp was, since then they have taken changes to make the venue way more accessible.Has taken huge changes. Yard Bar Is movable ramp, but not visible. Don’t have sign letting people know but happy to put sticker up. Duke of Wellingtons Ramp available. Freedom Kevin had spoken to Chris Nagel, head doorman a few weeks ago, and he said he would put up visibility sign – not there yet.However very receptive, and said would put in sign in 2 weeks max. Movable ramp is there, but supervisor didn’t know how to use it. ← 27.02.19 – The ‘Gay Liberation Front’ Dance Party – 50th Anniversary Special!